Take a break from the holiday bustle and relax as Bennington Museum presents VC3, a new trio whose three distinguished cellists – Elizabeth Anderson, Käthe Jarka, and Robert La Rue — are bringing the multi-cello ensemble into the world of serious chamber music. Held on Saturday, December 15 at 2:00 pm in the Ada Paresky Education Center and Paul Paresky Court of the Bennington Museum, this concert is free and open to the public thanks to the support of Alison Nowak and Robert Cane. Reservations are not required for this performance, and it is accessible to those with disabilities. For this concert, VC3 will perform Three Fantasias for Three Viols, Z. 732-4 (1680) Henry Purcell (arr. Moore), V3 (2016) Inessa Zaretsky, Sonata in G minor, BWV 1029 J.S. Bach (arr. La Rue), Serenata per tre violoncelli (2007) Krzysztof Penderecki, and Suite for Three Cellos (1921) Fernand de la Tombelle. In two seasons, VC3 has built a rich and eclectic repertoire spanning five centuries which includes original, historical compositions, arrangements and transcriptions, and new works written especially for the group to perform. They have been warmly received in venues throughout the greater New York City area, including the Arion Chamber Music, Hudson View Gardens, and Salon 74 series in Manhattan, the Friends of the Warner Library series in Tarrytown, and Bruce Adolphe’s Garden City Chamber Music series on Long Island. 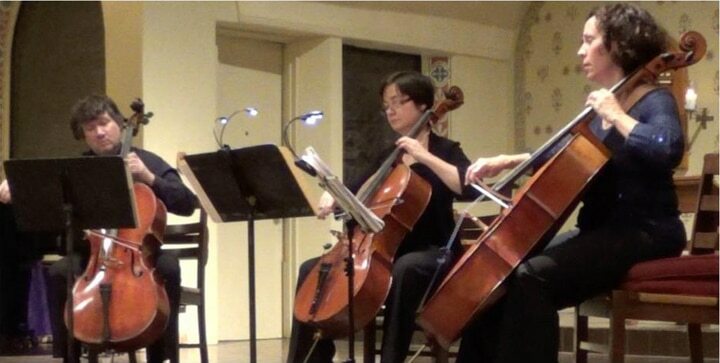 Elizabeth Anderson performs as cellist of the Cassatt String Quartet, and with VC3. She was formerly cellist of the Naumburg Award winning Meliora Quartet and is Assistant Principal Cellist with the New York City Opera Orchestra. As recitalist she has toured throughout the United States, Europe and Asia. Elizabeth has recorded for Nonesuch, Telarc, (Mendelssohn Octet with the Cleveland Quartet) and RCA. Her newest solo CD, “Latifa Noor” includes improvisations on Indian Raga for cello and voice. Käthe Jarka has performed to critical acclaim in major concert venues across the United States, Canada, and in Europe as a recitalist and chamber musician. She has collaborated with such artists as Yo-Yo Ma, Ruth Laredo, Grant Johannesen, Donald Weilerstein, and the Juilliard Quartet, and has participated in the Marlboro Music Festival. She has appeared several times as a guest with the Chamber Music Society of Lincoln Center. As a member of the Shanghai Quartet, she toured extensively, appearing at the Tanglewood, Norfolk, and Ravinia festivals, among others. She is also an artist member of the Garden City Chamber Music Society. Robert La Rue was First Prize Winner of the National Society of Arts and Letters Cello Competition, selected by a jury chaired by Mstislav Rostropovitch. Currently the cellist of the Alcott Trio and a member of VC3, he was also cellist of the New England String Quartet and the Lehner Trio. Summers have taken him to the Bard Festival and the Norfolk Chamber Music Festival (where he has served as visiting faculty of the Yale Summer School of Music.) Internationally, he has been heard at the Evian Festival in France, the Banff Festival in Canada, on the Listasafns Sigurjons Olafssonar Concerts in Reykjavik, Iceland and the Frideriksdal Slotskonzerter series in Denmark. He is a member of the New York City Operat Orchestra and has also performed frequently in the Mostly Mozart Festival Orchestra. Bennington Museum is located at 75 Main Street (Route 9), Bennington, in The Shires of Vermont. The museum is open Thursday through Tuesday, 10 am to 5 pm and is wheelchair accessible. Regular admission is $10 for adults, $9 for seniors and students over 18. Admission is never charged for younger students, museum members, or to visit the museum shop. Visit the museum’s website www.benningtonmuseum.org or call 802-447-1571 for more information. Bennington Museum is a member of ArtCountry, a consortium of notable art and performance destinations in the scenic northern Berkshires of Massachusetts and southern Green Mountains of Vermont, including The Clark Art Institute, Williams College Museum of Art , Williamstown Theatre Festival (20 minutes away); and MASS MoCA (25minutes away). Visit ArtCountry.org for more information on these five great cultural centers.